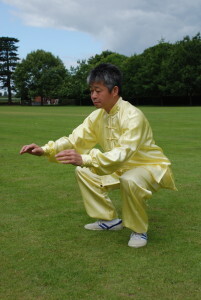 Another form of Zhan Zhuang站椿, and the one we practise the most is Ma Bo Zhang馬步樁 – Horse Stance. This Zhan Zhuang can be found in many styles of Qigong and Kung Fu. It is called Ma Bo because it looks like we are riding a horse. In Kung Fu, any stance is called Ma馬, which means horse, so our legs are like a horse. Sometimes it is still and sometimes it is moving and this is why in Chinese Kung Fu we use Ma to cover all footwork, whether it is stances or stepping. For example Gin Ma 進馬means forwards stepping and Tui Ma退馬 means backwards stepping. In Horse Stance we train our Qi, our bones and develop calmness and stillness. The upper body should always be relaxed and all our weigh should be on our legs. Our eyes should be open, so the Qi can be released through them. Generally we do not want to release Qi, but in Horse Stance and particularly in Low Horse Stance, there is so much Qi that we need to let some go and this is releases through the eyes. This also helps to prevent too much heat and Qi going into the head. It is like a kettle boiling, we need to allow the steam to release out. In Horse Stance we have three levels or three positions which we use to adjust the balance of our Qi and strength.